I look back at the person who wrote that post and she had no idea divorce was in her cards. She had no idea that straws would eventually break the camels back. She had no idea that she would wake up and realise she had completely lost any sense of self. She had no idea what she really needed to get rid of. But she eventually woke up. And she realised a lot. Very quickly. She realised her capabilities stretched beyond anything she ever could have imagined. She understood that the right thing to do isn’t always the easiest thing to do, but it still must be done. I don’t want this post to just be about my divorce. I’ve done lots of other things since that post. I got a full time job that ticks all the boxes of being close to home, flexible enough for a single mother of 3, allows me to practise any faith and working amongst a team that is awesome 98% of the time. I’m not even going to stutter when I admit that, I’m good at my job. I also graduated. Whilst working full time for the last year of my degree and going through the separation. I graduated while trying to navigate a minefield of other responsibilities and challenges, but I still managed to do it. My parents and my children were in the crowd to literally cheer me on. I could hear them yelling “Go Mummy!” as I proudly walked across that stage while whispering to myself, “Girl, you actually did it! Don’t trip!”. 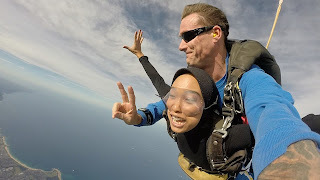 I turned 31 and sky dived. Sky diving was always something I've always wanted to do and with no one telling me not to and the financial abilities to do it, I had nothing stopping me. Jumping out of a plane taught me that I am braver than I know but at the same time, in the grand scheme of things, me and my life and my situation and struggles are quite small. Looking up at the endless sky and looking down at all the people and places below you as you tumble through clouds, really changes your perspective. Overall, I am hopeful. I know that this divorce was the right thing to do. I know that I gave this marriage and any chance of reconcile 100%. I don't have any regrets. I know I did the best thing for me and for my girls. I have had moments, and still do though far and few between when I question my decisions, but those moments are swiftly followed up with a sign that the hard but right thing to do was done. I have a new found vivacity for life that I didn’t even realised had slowly died during the course of my marriage. I didn’t even realise that I had a backing tape on repeat in my mind that just kept telling me “this is it, and its okay but this is really it. This is how its going to be forever and it's okay”, when really it wasn’t. After news of my separation had slowly leaked out to friends and acquaintances, comments from long time friends such as “yeah you got really quiet once you got married” or “welcome back baby girl” opened my eyes to the fact that other people had seen me lose myself before I even noticed. I went through a stage where I thought my failed marriage was a waste of 12 years our of my 31 years of life but my mother, my councillor and close friends are quick to remind me, my marriage was far from a waste. My marriage brought my 3 beautiful girls into this world. My marriage funnily enough taught me independence, strength, resilience and in the end it taught me courage. My marriage taught me what is unacceptable in a loving relationship. My marriage taught me that you can’t rely on other people to make you happy. My marriage taught me that self respect is the first key to getting others to respect you. My marriage taught me that having standards and expectations for any relationship whether it be between a couple or between friends, is healthy and necessary. My marriage taught me that open and honest communication is the key to success. Above anything my marriage taught me that sometimes the hardest thing to do is the right thing to do, but it still must me done.